Email list pages are the pages which are used for email subscription, unsubscription, confirmation and profile update for the end subscribers. These pages are visible to the end subscriber, located at particular URL of the email list. These form pages are hosted at app.easysendy.com server. It is required when you want to collect the email subscriptions directly without using any website of yours. To create/ update an email list pages, first create an email list and select the email list, in which you want to create pages, then click on “Pages” icon. After you have created and email list from “View all List” menu. Go to Lists -> View All List -> Select a list -> Click on Pages icon. By default, you will land on Subscriber form list page. You can select other list page from the right side of the screen. 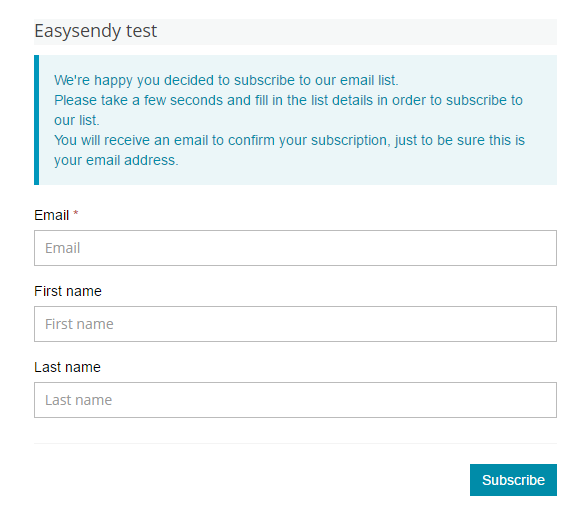 Subscribe form page is used to add email subscribers to a particular email list. This page has email field, first name and last name by default, which you have added in Custom Fields of email list. If the customer fields are not set as *required, then you can remove them from the page editor. 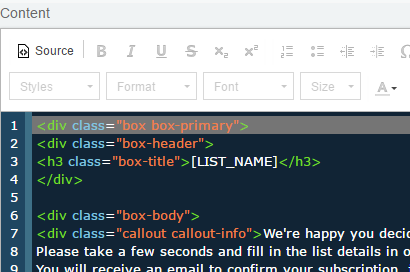 Inside the easy to use editor, you can import your own page template with inline CSS and HTML code. External CSS and JS can be added to the page by using Custom Assets option from the same page. [SUBMIT_BUTTON] – Add the submit button to accept user input detail. *Visibility of fields appearing at the page can be controlled through Custom Fields option. Pending Subscribe Page is the page which shows the subscription status to the email subscriber in a particular email list. This page is shown to the email subscriber after they submit their email address inside the form and they are yet to receive opt-in email for email confirmation. You can edit this page from the editor, where you can add inline CSS and HTML template. External CSS and JS can be added to the page by using Custom Assets option from the same page. Subscription Confirmed Page is the page which shows the subscription status to the email subscriber in a particular email list. This pages is shown to the email subscriber after they click on the verification link, which they receive inside the opt-in email. This is the page which is used to update subscriber detail. This page has all the field similar to subscribe form page, where an email subscriber can easily update all his detail. This is the page which is used for the subscriber to unsubscribe their email address. This form pages will take the unsubscriber to Unsubscribe Confirmation page in order to confirm their desire for unsubscription. This is the page which appears after an email subscriber expresses their desire to unsubscribe themselves from an email list. You can customize this email page to look beautiful and to use so that the email unsubscriber should not feel bad while unsubscribing from your email list. This is the email template which an email subscriber receives when they add their email to the email subscription. This is the opt-in confirmation email template which has a confirmation link. This is the email template which an email subscriber receives when they remove their email from an email list. This is the opt-out confirmation email template which has a confirmation link. This is the email template which an email subscriber receives after they are successfully added to an email list.